Mike will appear at 11 a.m., 1 p.m. and 3 p.m. on Saturday, April 28 at the Calvert County Home Show at the Fairgrounds in Prince Frederick. Find more details here. The heck with the cats, Sarah — I want video of your laughing ants! But in all seriousness, “bait traps” are the answer — if you use them correctly. Bait traps should work well; the “secret” to using bait traps successfully is to have patience. The traps lure worker ants with sugar or some other food source. That food has been treated with a very low dose of something toxic to ants (sometimes a natural substance; sometimes a chemical concoction) that works so slowly it allows the worker ants to make repeated trips back to the queen with the bait. The workers eat some of the bait and feed some to the queen, and at first, nothing happens. But several days later, the first of the workers to find the bait gets sick and dies. Then, within a week or so, the queen is dead. Without the queen, the colony quickly dies out. So, again: The secret to any kind of ant control is to realize that the ants you see are only scouts. Somewhere nearby — maybe even outside — is a large nest with a queen. You can kill as many workers as you want, but the queen will just pump out more. That’s why sprays are useless; they never get to the queen. But worker ants will carry a low-dose ant poison back to the queen for you. You don’t have to find her; the worker ants are both the problem and the answer. The original “pet and child safe” ant baits contain one form or another of boric acid. The label may call the active ingredient “borax,” “borate,” “sodium tetraborate” or something similar, but all are formulations of the element boron. How safe is boric acid? Your grandparents used it as an eye wash. Boron is a component of your “One-a-Day” vitamins. Despite a somewhat scary name, Avermectin is isolated from a naturally-occurring soil organism, and its effects are limited to certain classes of insects. It’s the active ingredient in some “Raid” brand ant bait products I found for sale. Abamectin is a derivate of the same class of soil-dwelling organisms. It’s the active in a “PIC Home Plus” product that’s widely available. Like boric acid, all of these naturally-occurring soil organisms are slowly toxic to ants but have little to no effect on people or pets — especially at the low concentrations and small amounts that are used in bait traps. Oh, and the containers that are used for virtually all of these baits — like the classic metal hockey puck with the little holes on the sides you poke out with a key — are designed to allow easy ant entrance and exit but little to no access to what’s inside to people or pets. Sarah in Burke says that the ants she’s fighting are in different rooms and on different floors. And, as she wisely notes, ants are often forced to come indoors when the outside soil is saturated, as it is now. So, let’s suggest that she may have several different colonies working her turf. That would mean different queens as well — so it’s important to set up traps in every room where you see ants. 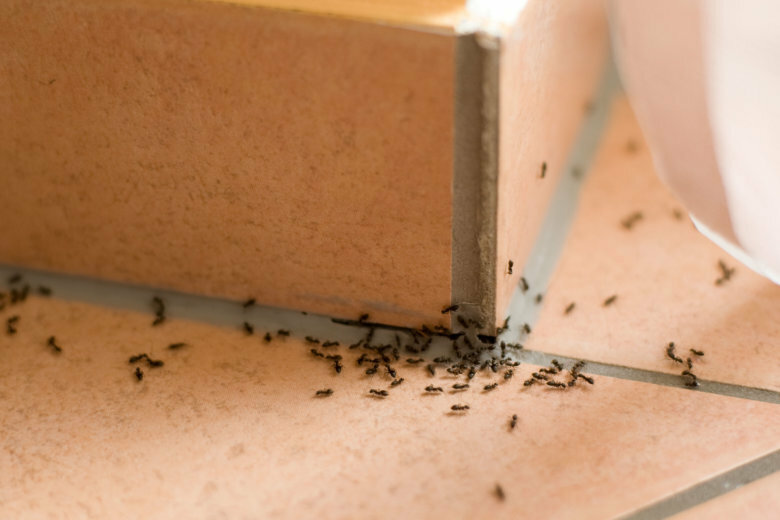 Place the bait traps in the direct path of the ants, don’t squish any worker ants, and within a week, the whole colony (and/or colonies) should be dead. Another queen from yet another colony can (and will — ants are the most abundant living creatures on the planet) send her workers in afterward, so always be ready with fresh traps. You should also wash any areas the ants traveled over with plain old soap and water to erase the pheromone trail that ants use to direct new workers to the original food source. Getting rid of old trails can be very protective against future invasions. Now, a pair of warnings. Do not succumb to the temptation to spray. Toxic sprays just kill worker ants and endanger you and your pets. They never get to the real target: the queen, who may be a great distance away. There is no indoor pest problem that is best served by spraying anything. That includes fleas, bedbugs, termites, roaches and anything else you can think of. Do not succumb to the temptation to kill ants that are completely outdoors. Outdoor ants pose no threat to you or your garden. In fact, they aerate the soil and eat weed seeds. But their biggest benefit is termite protection. Termites are terrified of ant colonies and will never try to set up shop on your landscape if ants are around to raid their nest.